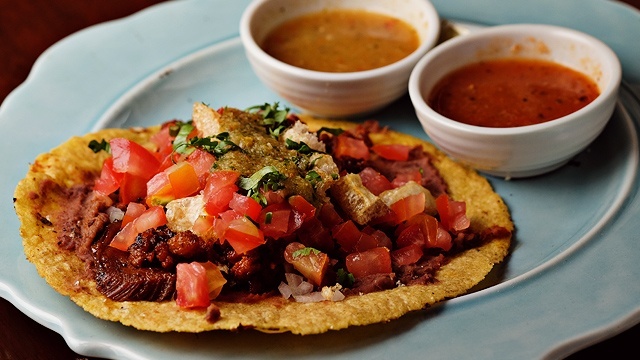 You'll be saying delicioso in no time. (SPOT.ph) Fun fact: Spain has five different verbs dedicated to eating, so that should already tell you about the gastronomical experience that is Spanish cuisine. And with the Philippines’ long, long history with Spain, it’s almost impossible not to have any remnants of their culture ingrained within ours—including their food. 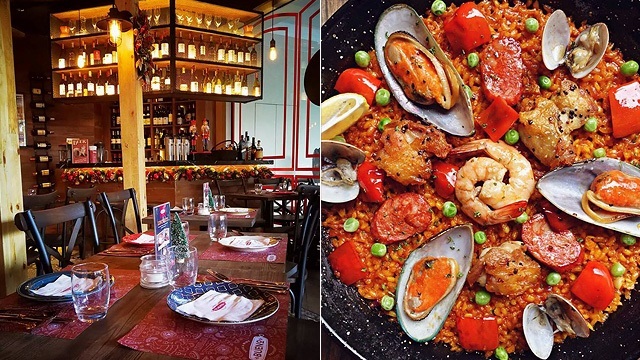 From fancy tapas joints to casual places where you can have a glass of sangria with your paella, the Metro is chock-full of places serving some of Spain’s vibrant dishes. 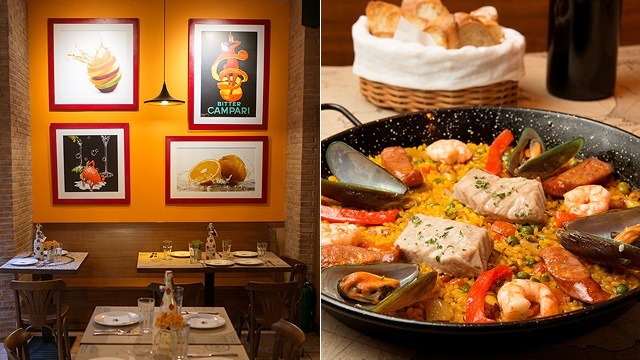 We’ve rounded up some of the best spots to feast like a Spanish king in Manila. 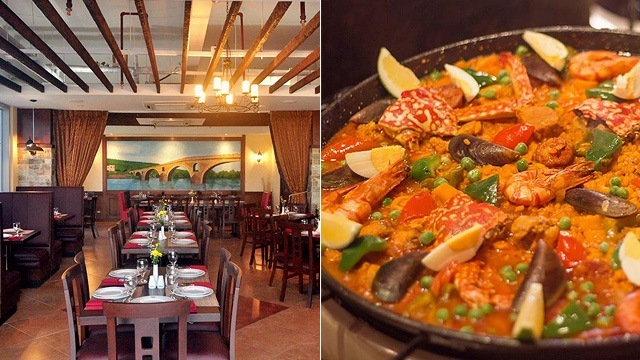 Complete with all kinds of traditional Spanish dishes and drinks, Bueno Tapas & Wine Restaurant promises to satisfy anyone’s hankerings and then some. Try some of their bestsellers, like the classic Callos a la Madrileña (P345), a slow-cooked tomato sauce-based dish that combines all the good stuff like pork knuckles and tripe, or their Estofado de Res (P420), a hearty Spanish beef dish that’s braised to perfection for eight hours. If you want a sweet end to your meal, have a slice of their Tarta de Santiago (P200), a moist almond cake that’s topped with a generous amount of citrus compote and creamy vanilla ice cream. Bueno Tapas & Wine Restaurant is at G/F Level Retail Row, The Grove by Rockwell, E. Rodriguez Jr. Avenue, Pasig City. 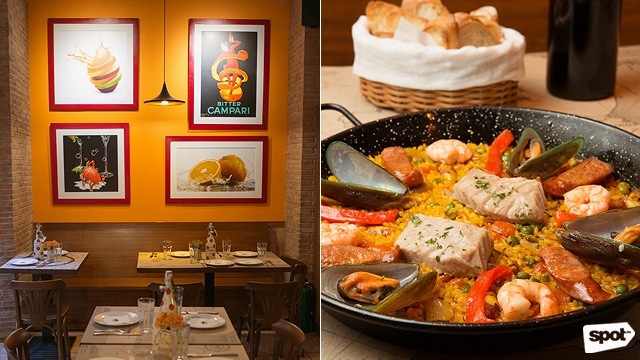 Alba Restaurante Español has been around for over six decades, opening up a handful of outposts around the Metro along with a main branch in Makati. Their special Jamon Serrano (P400), a homemade take on the traditional Spanish cured ham, is packed with flavor that’s hard to beat. You can also grab an amazing Tortilla Española (P220), a classic and simple Spanish potato omelette which is a crowd favorite in Spain. And since we’re all about classics here, why not have some of their house-special Paella Valenciana (P580), brimming with deep-orange Valencian rice, chicken, pork, seafood, and vegetables? See a list of Alba Restaurante Español branches. 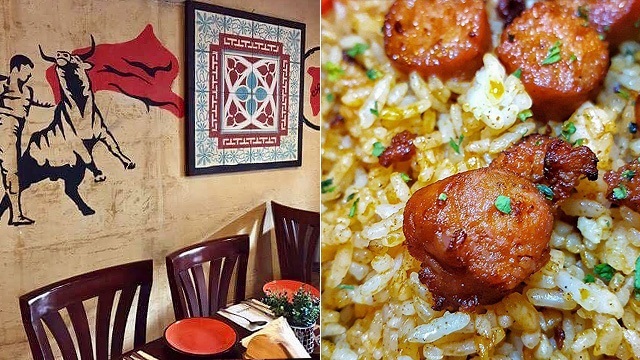 Besides Las Flores' low-key and chill vibe, what’ll really take your breath away are their flavorful versions of popular Spanish tapas. Shrimp lovers cannot miss their Gambas al Ajillo (P575), an all-time favorite dish with spicy shrimp swimming in a pool of olive oil and garlic. There’s also the Jamon Iberico Croquetas (P250), which is as good as it sounds—fried potato balls stuffed with the famous Spanish Iberico ham. And for a little bit of indulgence, we wouldn’t pass up a serving of the Bombas de la Barceloneta (P250), or potato and Wagyu beef “bombs” served Barcelona-style. Delicioso! 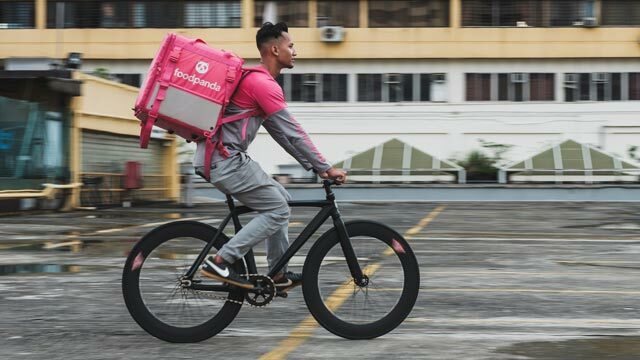 Las Flores has branches at G/F The Podium, ADB Avenue, Ortigas, Mandaluyong City; and G/F One Mckinley Place, 25th Street, Bonifacio Global City. 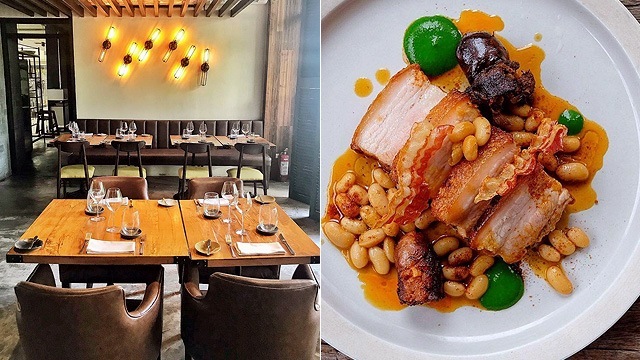 As its name suggests, The Black Pig can be an absolute haven for carnivores and meat lovers. 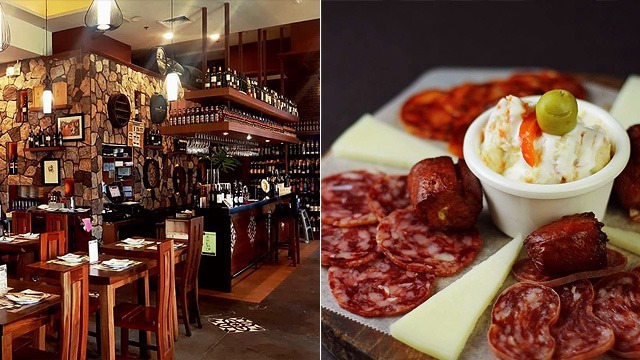 Tucked away in its little corner in the south of the Metro, the Spanish restaurant puts forward some tasty dishes and tapas perfect for any occasion. A great starter would be their Bocadillo de Calamares (P390), or crispy fried squid doused with paprika and served with a side of garlic aioli. Their Shrimp Risotto (P450) is also one tasty dish to try, but if you’re looking for a straightforward meal that can still make your taste buds sing, you might want to go for the Black Pig Ham and Cheese (P390), a simple jamon serrano-and-cheese sandwich that’s like an elevated version of your childhood merienda. The Black Pig is at 2/F The Commerce Center, Commerce Avenue corner Filinvest Avenue, Filinvest City, Muntinlupa City. There's bound to be a Barcino near you whichever city you are in—a good thing because it means you don't need to go far to have your fill of tapas. Sample some of their best-selling tapas like a helping of their savory and fried-to-perfection Croquetas de Chorizo (P320). For something a little heavier, have a pan of Arroz Montañes (P580), a mellow, creamy rice dish with a hefty mix of roast chicken, pork chorizo, and seasonal vegetables. And if you don’t mind a little bit of a splurge, have the Spanish delicacy that is Lengua Estofada (P650), ox tongue slowly braised in red wine and tomato sauce until it’s absolutely melt-in-your-mouth. See a list of Barcino branches. 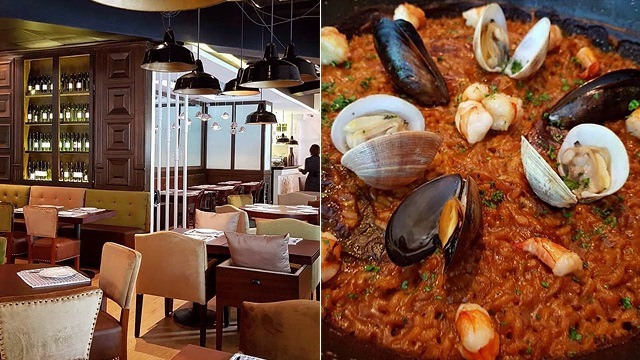 Calderon is the place to visit when you want Spanish food that’s not too rich and savory, and tailored to the Filipino palate. To see what we mean, just check out their no-frills yet incredibly inviting menu—from the Salpicao (P490) to the Caldereta Española (P480), a rich tomato-based beef stew with potatoes, carrots, olives, and chorizo­. Plus, here’s one dish you wouldn’t be able to resist: Their tempting Chorizo Sisig (P270), a must-try for all sisig aficionados and chorizo lovers everywhere! Calderon has branches at 403 F. Calderon Street, Little Baguio, San Juan City; 12-C East Capitol Drive, Kapitolyo, Pasig City; G/F Classica Condominium, 112 H. V. Dela Costa Street, Salcedo Village, Makati City; and The Corner Market, Podium, Ortigas, Mandaluyong City. Bistro Madrid promises to take you to every region of Spain with their menu. Just have a look at their Macarrones Andaluza (P350), a pasta dish with a heavenly sauce made of chorizo and tomatoes topped with a tangy Manchego cheese. We also can’t resist the Pork Tenderloin with Sobrassada All-i-oli (P345), a dish made of pork medallions wrapped in a layer of bacon. It comes with creamy mashed potatoes with Mahon cheese and cured Spanish sausage that’ll have your toes curling. Be sure to stay for dessert; their Cinnamon Bread Churros with Hot Chocolate (P250) are pillow-soft and so good, we won’t blame you if you need more than one serving. 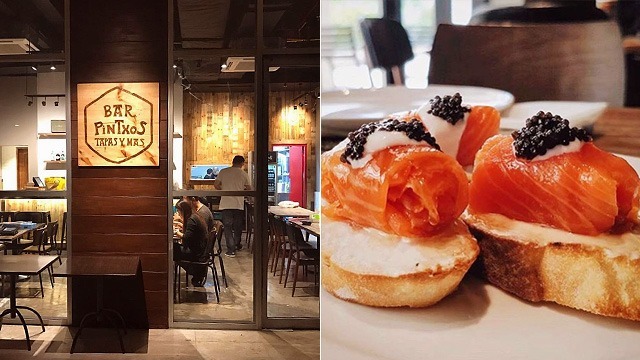 Bistro Madrid has branches at Estancia Mall, Capitol Commons, Oranbo, Pasig City; and Forbes Retail, Forbes Town Center, Burgos Circle, Taguig City. Over at Donosti Pintxos y Tapas, the stars of the show are all-time favorite Spanish tapas and small bites. With both traditional and innovative dishes in their repertoire, get a load of their Croissant con Jamon (P180). It’s basically buttery French croissant with tomato and indulgent jamon serrano. You can have it with chorizo iberico, too! If you’re not sure what to order, you can have their Degustacion de Croquetas de la Casa (P380), or a sampler of four different kinds of croquettes. But for something packed with all that juicy and rich protein, have a taste of the Magro con Tomate (P310), a hefty slab of pork belly in a homemade tomato sauce with dry sherry wine. Donosti Pintxos y Tapas is at G/F NAC Building, 32nd Street, Bonifacio Global City. If you’re looking for something really classic, nothing beats Bar Pintxos Tapas y Mas (we mean, even the name says it all!). For starters, have some of the Tortilla Patatas Chorizo (P250), an upgraded version of the classic omelette with bits of chorizo between each fluffy bite. One of their more loaded paellas is the Paella Mixta (P330), with chicken, shrimp, and chorizo for when you can’t decide which protein you’re hankering for. And if you’re up for a rare splurge, you could also get a plate of the Bistec (P700)—a slab of Kitayama flat-iron steak served with a side of crispy fries. 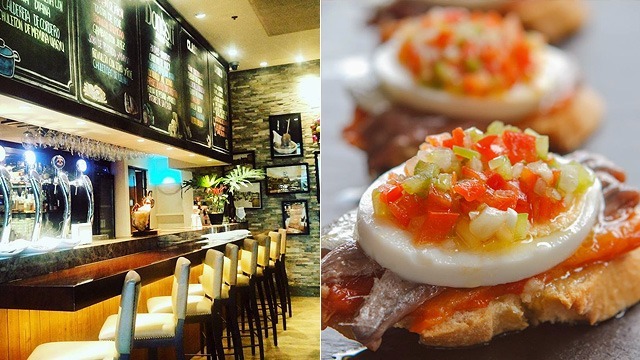 Bar Pintxos Tapas y Mas has branches at G/F Gesu Building, Don Jesus Boulevard, Cupang, Muntinlupa City; G/F Fairways Tower, 5th Avenue corner McKinley Road, Bonifacio Global City; and Paseo Parkview Tower, San Augustin corner Sedeño Street, Salcedo Village, Makati City. 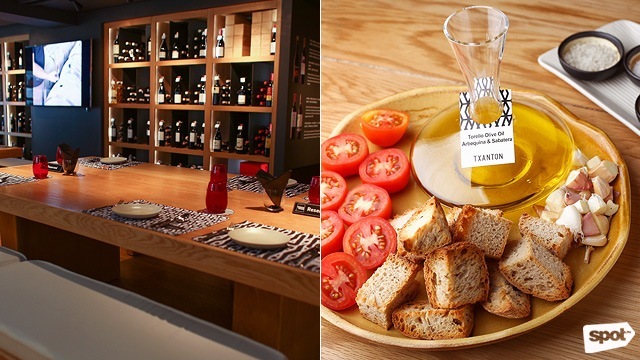 If you love a great wine and jamon pairing like all the souls wandering Barcelona, then you’re going to fall in love with Txanton. The jamoneria puts the spotlight on delicious Spanish tapas and dishes that you might not have heard about. If you’re new to the Spanish food scene, a good place to start can be the Pisto (P515) or stewed veggies with tomato and jamon. Want a bit of everything? Grab a platter of the Surtido Iberico Experience (P950), which has an assortment of jamon iberico, chorizo, salchichon, and lomo. Txanton is at 2/F Alegria Alta Building, Chino Roces Avenue Extension, Magallanes, Makati City.